The genus Daphne belongs to the family of the Thymelaeaceae, the sparrows-tongues-plants (transl. from German – Spatzenzungengewächse). A narrow flower tube is characteristic of the Thymelaeaceae, in which, figuratively speaking, can only penetrate the small tongue of a sparrow. 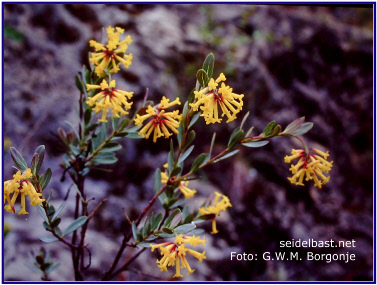 Below are two examples of other members of the Thymelaeaceae presented. Dais cotinifolia, also called "Torch-Tree", Pompon tree, or cheerleader bush was 1992 Tree of the Year in South Africa. Native to the southeastern parts of Africa and also Madagascar this tree grows primarily in forested hill country. In its natural habitat, this evergreen tree grows up to 6 m (20 ft.). The beautiful inflorescence is surrounded at the base of four small leaves. These four bracts remain after the flowers fall off the plant and become woody, brownish; visible as a small cup, like a torch. When Linnaeus described this plant in 1762, the torch in Greek, “Dais” provided the name of the genus. 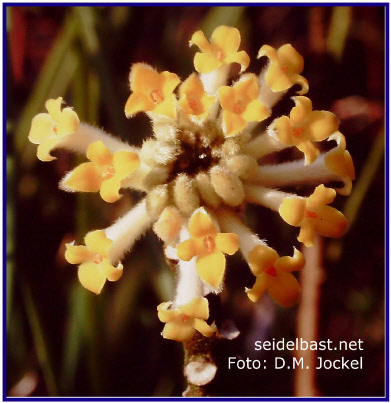 In contrast to the pompom tree Edgeworthia chrysantha is hardy in Central Europe. Already in early spring adorns the still leafless shrub with bright yellow, globular inflorescences. With just a few meters height, he fits into any garden. Very interesting is the branching mode. From each branch, three new branches arise always in monotonous regularity, so that this shrub has a triangular appearance. Characteristic of the genus Daphne is the wide variety of shapes and colours of these woody plants. There are both deciduous and evergreen species and hybrids. There are Daphne species, which grow not higher than ten cm and others that have the character of a tree with four metres height. There are daphnes without and with fruit set. The colours range from white through yellow, orange and red to black berries. It is even more colourful when it goes to the flower colours. Of white, yellow, green, pink, and red, to sky blue, everything is represented. Many plants have bi-coloured flowers. Is it any wonder that rock garden lovers all over the world enjoy the abundance of flowers and the fragrance of these plants? This one seems even more astonishing, considering the extremely simple structure of the flower. 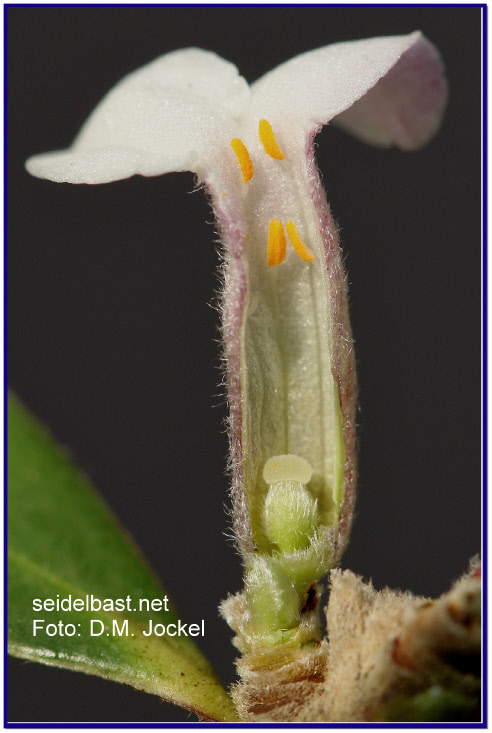 Four or five sepals are fused into a floral tube. Petals, as we know, for example, from the rose are missing. A very small species specific hypogynous disc at the base of the ovary is the characteristic of the genus Daphne and separates them from the genus Wikstroemia (scales at the base). The corolla is thus formed by sepals. With their colouring they imitate the absent petals. A show set in this form represents a petaloid calyx tube. For each sepal is a pair of stamens, which are one above the other. From the ovary forms a single-seeded berry. Daphne species with five sepals are for example, Daphne gemmata, Daphne rosmarinifolia and Daphne modesta. These species have therefore as described above, ten stamens instead of eight. 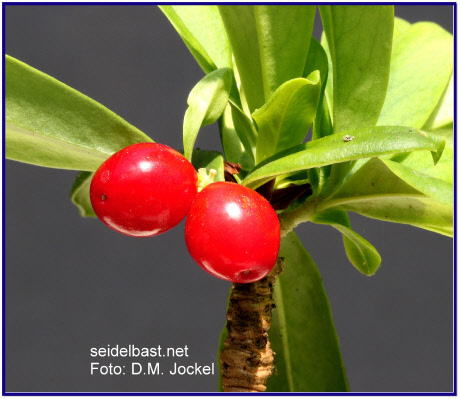 A morphologic examination of the former genus Daphne was made 1907 by W. Nitsche (Beiträge zur Kenntnis der Gattung Daphne) with the result that the anatomy of Daphne species depends on the ecologic situation and only in section Daphnanthes some morphologic rules were visible. The short-stemmed inflorescences are at the end of the shoot or lateral at the end of a short shoot. Mezereon, Daphne mezereum is the only example of the native flora for cauliflory where the flowers come directly out of the branches. Other cauliflorous species are cocoa, coffee, and the Judas-tree (Cercis siliquastrum). 1753 Linnaeus published his plant standard work “Species Plantarum”. The introduction of binomial nomenclature arranged the names of the plants from scratch. Previously there were up to twelve (sixteen) Latin or Greek words that described a species; this was now reduced to two- the genus name and the specific-epithet. The example of the spurge laurel, Daphne laureola, illustrates well, that also science can have a very personal touch. In the sixteenth and seventeenth century the spurge laurel was already known under the name -Laureola-. The naming came from C.& J. Bauhin [from: F. Sauerhoff, 2003, Entymologisches Wörterbuch der Pflanzennamen]. Laureola comes from Latin meaning small laurel or laurel branch. Meant here was, the real Laurel - Laurus nobilis. Emperor and victorious generals were crowned in ancient Rome with the laurel branch - laurola. Linnaeus added Daphne as genus name and kept -laurola- as specific-epithet. The genus name Daphne comes from the Greek language and also means laurel. The expression Daphne for the real laurel goes back to the Greek mythology. Apollo, the son of Zeus, had fallen in love with the beautiful river nymph Daphne. Daphne was tired of his intense requests and begged her father, the river god Peneios, he may help her. Peneios turned Daphne into a laurel tree, so that Apollo could not find her. It is Linnaeus humorous play on words, that the double laurel in Daphne laureola is no laurel. The origin of the German name “Seidelbast” for the Mezereon goes back to a time when the beehive was not yet invented, and honey was collected with the help of forest beekeeping. In hollow tree trunks of the forest the beekeepers had to seek the hives to harvest the honey. 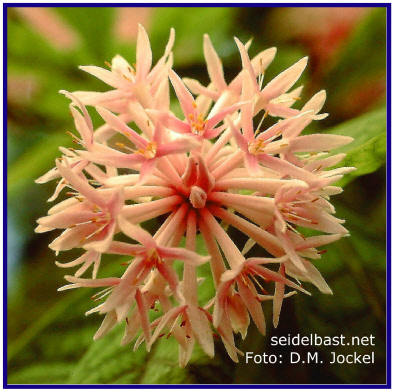 Zeidler is an old expression for beekeepers and “Zeidel", the old name for a bee. Mezereon occurred at that time still common in open woods. His early flowering at the end of March was the first food for the bees. 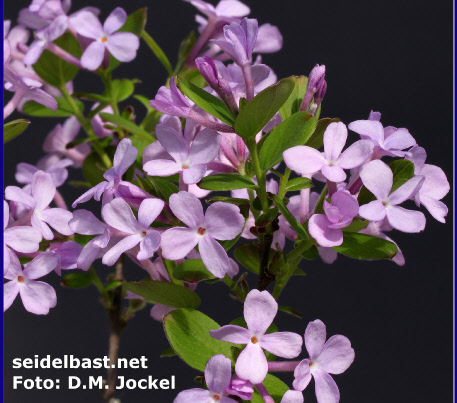 “Bast” is for bush and “Zeidelbast” or now “Seidelbast” means nothing else than the bee bush. Since more than three hundred years was in German-speaking countries the Mezereon cultured and used. Many names and many applications are connected with Daphne mezereum, but are due to the ingredients, from highly dubious nature. “Kellerhals = cellar-throat”, an old name for Mezereon gives insight into one of its uses. The term comes from the Old High German, "chellen" = torture and Kellerhals = torture-the-throat" [from K. Harz, 1988, Bäume u. Sträucher, BLV]. It was used for sore throats. With even stronger throat pain, the cause should be fought. 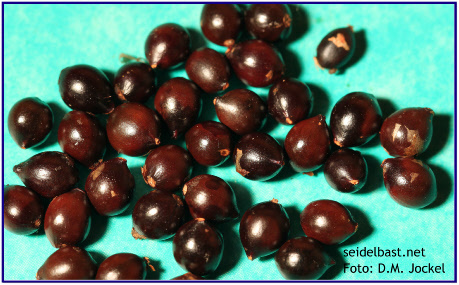 Not only the seeds, also other plant parts contain Mezerein and Daphnin. A burning sensation on the skin or the mucous membranes when it was taken orally is the first sign that warns to exercise caution. Come swelling, diarrhoea or vomiting, a poisoning exists that needs immediate medical attention, because the swallowing of a few seeds can also be fatal. For the highly active ingredients exists a pharmaceutical interest. In conventional medicine, there were investigations to take daphne-preparations to combat cancer. In homeopathy Daphne belongs to the standard repertoire, applied, for skin diseases and especially for neuralgia, where Daphne is used in combination with Cimicifuga. The fruits of the plants are harmless for birds and provide a welcome food source. The birds excrete the undigested seeds and thereby spread the seeds. One-commercial use in the genus Daphne, with its many small shrubs, is barely expected - it is the manufacture of paper. In the Asian region has been and is made from the bark of Daphne papyraceae (link to another website) handmade paper. This noble paper is used for important documents, religious texts or is exported. The focus of commercial interest lies in the sectors of ornamental plants and rock garden. 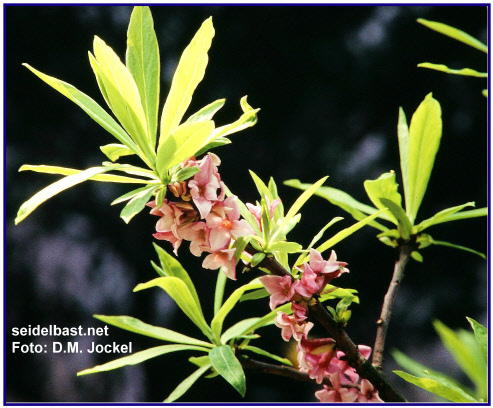 In Asia and Australia region selections of Daphne odora are popular. The same applies to the United States. The patent processes are running. Daphne caucasica hybrids, such as Daphne x transatlantica or Daphne x burkwoodii enjoy more and more popularity. The above mentioned Daphne selections and hybrids owe their popularity, not at least their availability. Beautiful, they are always, but they also have the advantage over other daphnes, that they can be easily multiply. Daphnes may, in their demands on the culture conditions or in the propagation, behave very capricious. 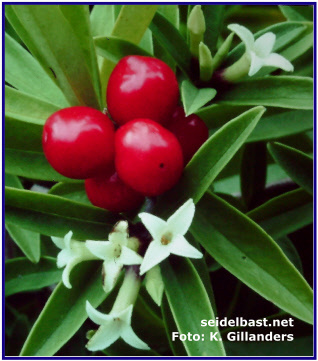 The genus Daphne currently includes about 150 species (Daphne-Monograph, 2001, Halda / not revised number ~90 Daphne species -see also chapter flower structure). 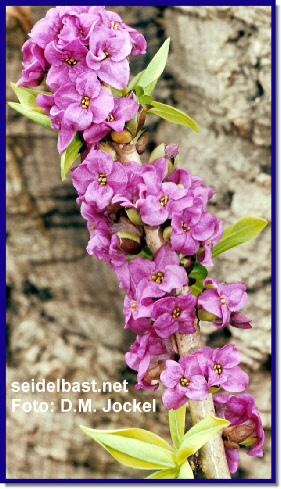 The most familiar and most common type, is Daphne mezereum, the Mezereon or Seidelbast in German language. 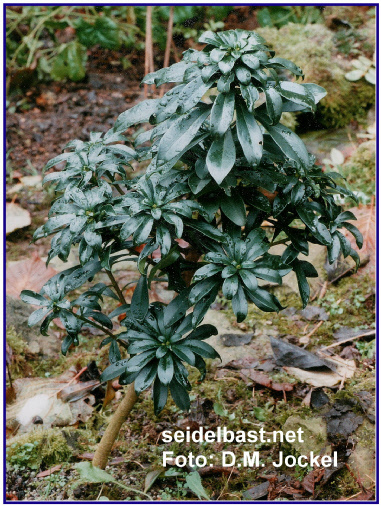 The term "Seidelbast" is used in German-speaking homonym, because this term stands for both, the above-mentioned type and also the genus Daphne. The distribution of the genus Daphne is limited to the northern hemisphere. Main distribution area is the Asian region. Flora of China alone lists more than 50 species, of which 42 are endemic, meaning they occur only in the Republic of China. In Europe, the main distribution area is in the southern mountains. However, the northern distribution area extends as far as Scandinavia. The southern occurrences extend to northern Africa, especially in the neighbouring countries of the Mediterranean Sea and the Middle East. For North America the species Daphne mezereum and Daphne laureola are known. But these were introduced by the settlers and feral. 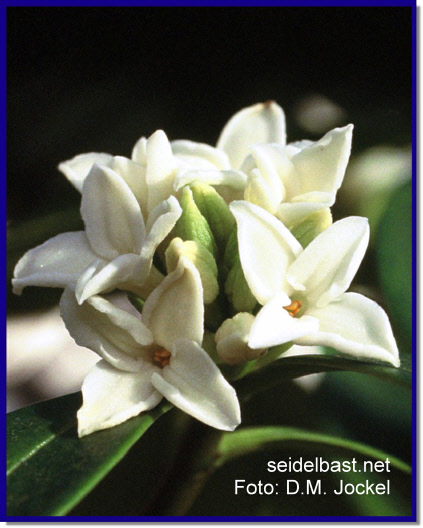 In the monograph “The Genus Daphne” , Mr. J.J. Halda reorganized the genus. For example species of the genus Wikstroemia were transferred into the genus Daphne. Accordingly, now the U.S. state of Hawaii also has some Daphne species. The left picture shows a Wikstroemia species in Tibet. The abundance of blossoms is immense by many daphnes, but it can be improved even more, because a repeated bloom time per year is nothing unusual. Especially hybrids are characterized by increased floriferous. Many daphnes exude an indescribable lovely scent during flowering. Daphne odora, the winter-daphne, was around 1900 a popular houseplant. Due to its early flowering, even in winter, this plant enjoyed great popularity. Imagine, it is a gray, cold winter day. You come back home frozen stiff and tired, then you open the door and a fragrance greeted you, which simply conjures just a smile on your face, because it makes you forget the troubles of everyday life. In Great Britain is the pleasant scent of daphnes described as "intoxicating". Understandable - because you never can get enough of it. Daphne bholua and Daphne petraea are two further examples for wonderful fragrant Daphne species. Browall was a good friend of Linnaeus. So Linnaeus named the genus Browallia after him with Browallia demissa (=the modest) as first species. Then his friend started a religious career, became an abbot and begun to criticize the work of Linneaus. The following plant received the name Browallia exaltata (=the arrogant).